SNES Kid Klown in Crazy Chase (USA) in 12:17.6 by Meerkov. Kid Klown in Crazy Chase (キッドクラウンのクレイジーチェイス) is a platform video game developed and published by Kemco for the Super Nintendo Entertainment System. It was released in North America in September 1994, Japan on October 21, 1994 and in Europe in 1995. The game features the Kid Klown, the player character who is tasked with rescuing the Princess Honey from the villain Black Jack. 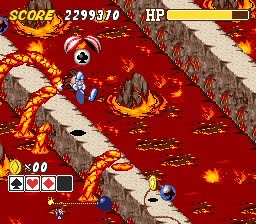 Players view gameplay from an isometric perspective as Kid Klown pursues a lit fuse in order to stop it from reaching a spade bomb.